Today's post will deal with the remaining aspects of this issue that were not covered in my first two detailed posts. I will briefly discuss each of these in more detail. 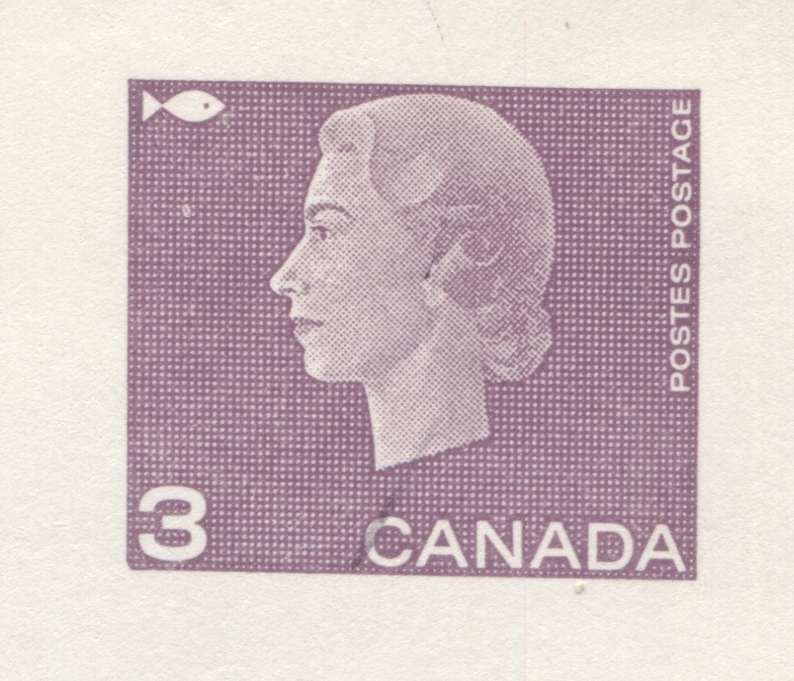 3c stamp design showing even dots and no white patches. 4c red design which appears coarser, with white patches. A second group of printings that became available in 1964, and were available for general use until well into 1966 show the Queen's hair s a series of lines instead of dots. Unfortunately I do not have an example to illustrate here. Here there were also differences in size, with the 3c purple coming in two sizes: 23 mm x 19 mm and 25 mm x 21 mm. There was also a scarce type of #10 3c envelope that had a pointed flap (knife) and an inspection notice that was either 36 mm or 41 mm wide. I believe that this is an aspect of the issue that deserves much more in-depth study to determine exactly what does exist. At the moment, Unitrade lists both #8 and #10 sizes for every variety that they do list, for a total of 16 listed types. 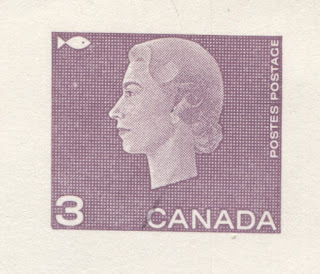 Unitrade lists a 3c purple and 4c red envelope for the stamp design that shows the hair as dots, while a 3c and 5c are listed for the hair consisting of lines. These are just basic listings for the most common size that are found that are neither #8, nor #10. It should be noted that there are many, many different sizes in existence, but many of these are very scarce - especially in used condition. 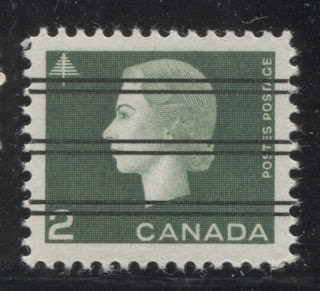 Only one 2c green post band was issued during the life of this issue. It exists both normal and pre-cancelled with 5 parallel green lines. I do not know whether careful study of these would reveal any significant size differences or not, but at the moment Unitrade does not list any. The first type in use from 1960 to 1966 shows a plane in the centre, and in bright red a maple leaf and "Canada" appears above the plane, while the 10c value and "Postes Postage" appears below the plane in a curved 2 pointed ribbon. 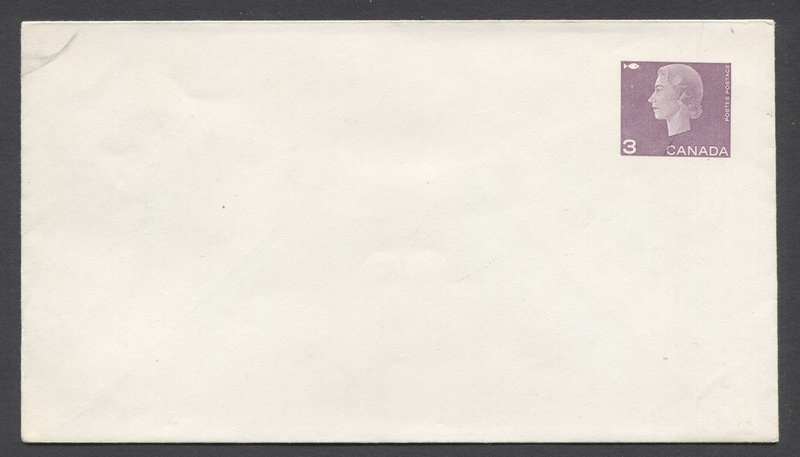 The differences that are collectible in these envelopes have to do with whether the flap joins are rounded or squared, as well as whether there are 4 or 5 dotted lines for the address. 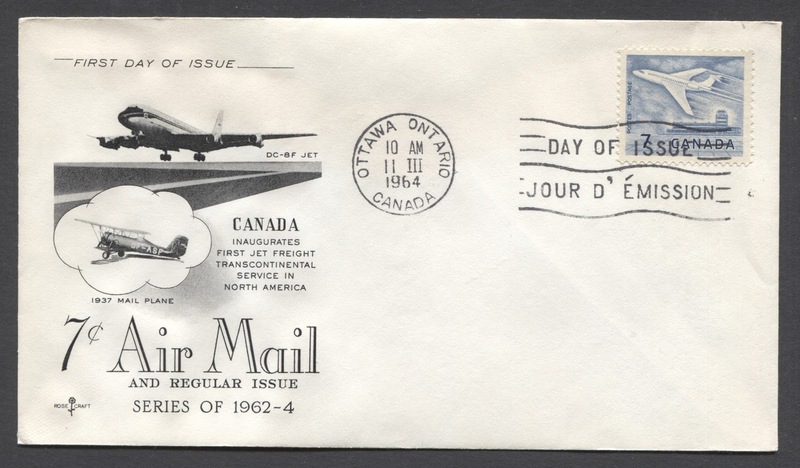 The second type in use from 1966 to 1967 shows a stylized plane, like a paper airplane in the middle. Off to the right above the plane is "10c" in blue hollow numerals. 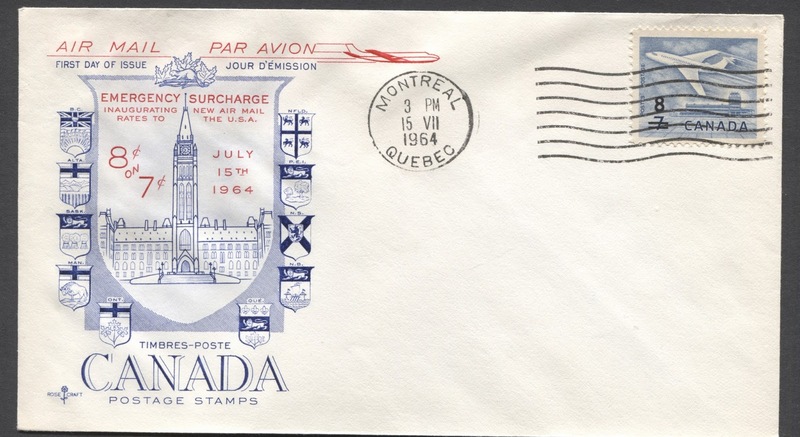 A red maple leaf appears directly in front of the plane, and then below the plane appears "Canada" in large solid blue letters and then "Postes Postage" in smaller letters below "Canada". The back of these letter sheets had "Expo 67" and the Centennial emblem on the back. There were two sub-types of this air-letter. One has a dotted line where it says "first fold here", while the second has no such dotted line. The first type is the most common, but the second type is quite scarce, especially in used condition. There were three basic types of postcard that were issued during the life of this issue: the 3c postcard, the 4c postcard and the 3c +3c reply postcard. The 3c and 4c cards in turn were either blank as shown above (what Unitrade calls type 1) of they had the simple bilingual inscription "Post Card/Carte Postale" in the centre. 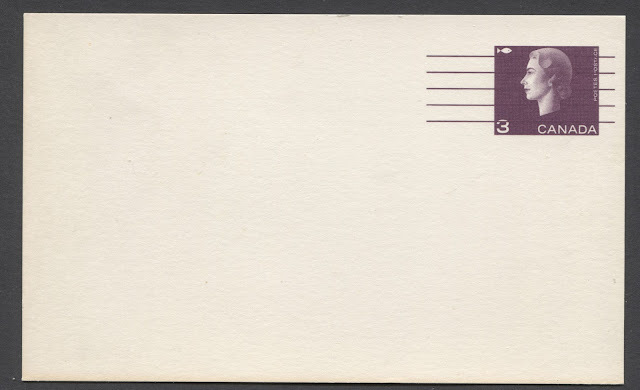 In addition, both the 3c and 3c +3c reply cards exist precancelled with 5 parallel lines as shown above. The 3c cards also exist both rouletted and on mimeograph machine stock, and all of these varieties in turn exist precancelled, so that Unitrade lists 12 different cards. 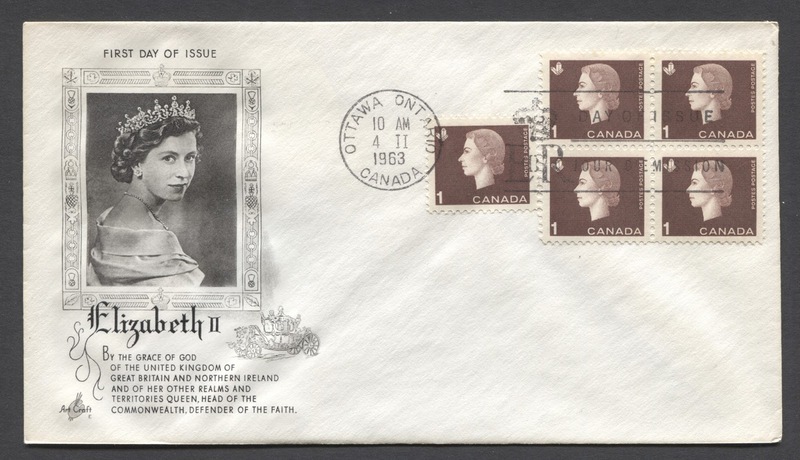 Interestingly there are no listed variations either in the stamp image size or in the appearance of the Queen's hair with these cards, as there was in the case of the pre-stamped envelopes. This does not make a whole lot of sense to me, and leads me to think that such varieties do in fact exist, but that this material has simply not been studied in enough depth to reveal their existence. 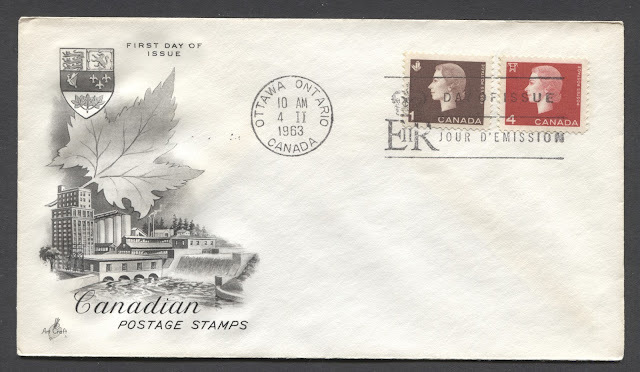 There are several different ways to collect this material, from obtaining one mint and used example of each, to looking for uprated usages to foreign destinations, to seeking out one used example from each major Canadian city, in the correct time period. What is certain is that this material will prove to be much more challenging than the catalogue may make it appear, once you actually start to seek the material out. The BNA proofs website only lists one proof item for this issue, and it is shown above. 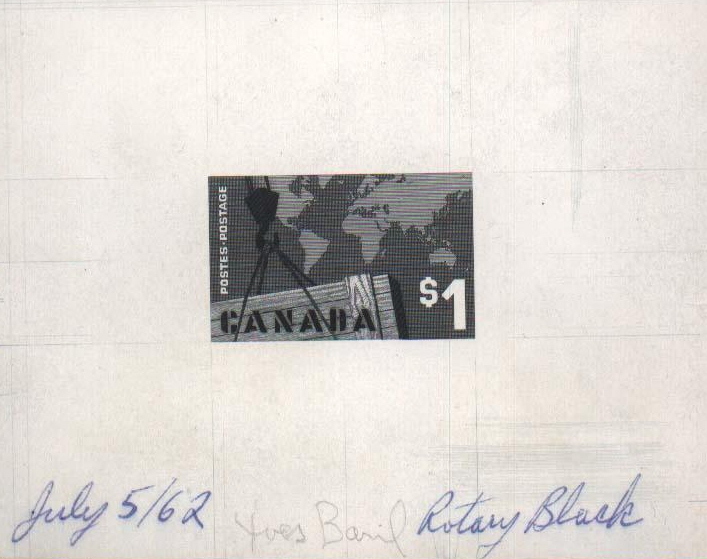 It is a unique, signed trial colour proof of the Export $1 in black. I have to admit that in all my years of perusing auction catalogues and working in the auction trade, I have never seen any proofs offered for sale of any other value. Why this is, I do not know. They must exist somewhere. My suspicion is that they are all in the National Postal Archives and have not yet made it into private hands. 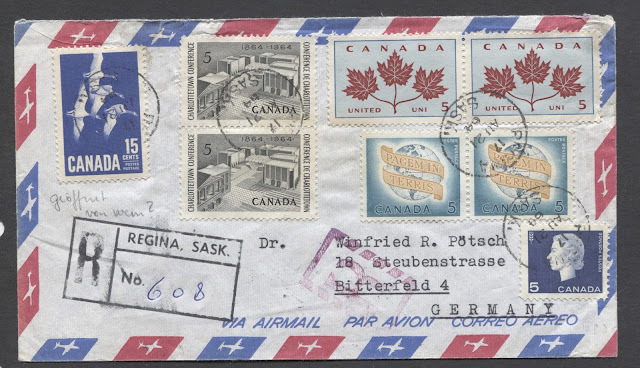 I'm going to spend a bit more time discussing the covers from this issue than I usually do, as there are several varieties that you can pursue, both with regards to the cachets that you can collect, the configuration of the stamps on the cover, and the cancellations that can be found. The most common cachets that can be found on this issue are ArtCraft and Rosecraft cachets. Each of these cachet makers produced several different cachet designs, as well as several different colours of cachet, making for a very large number of collectible covers. In addition to these two cachet makers, there were upwards of 25-30 different cachet makers who were active at the time of this issue, who produced their own designs as well. The general manner in which these were sold was to eventually address them to customers who had subscribed for them and to send them through the mail. So in order to go through, each cover had to have at least 5c postage, or 4c in the case of a local cover. This is one factor that determines how many, and which stamps appear on the cover. The cachet makers also recognized that many collectors liked to collect pairs, blocks, plate blocks and sets on cover. 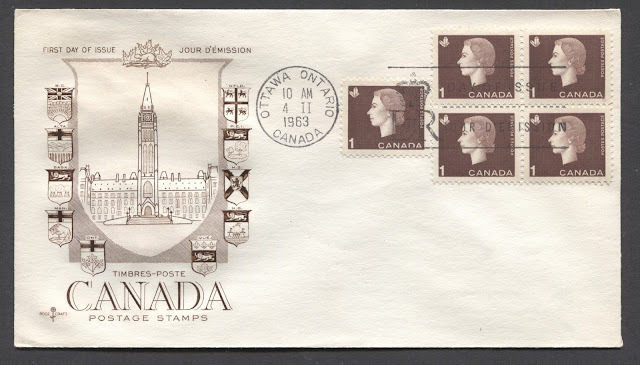 Thus many covers will be found that bear more than 5c or 4c postage in order to accommodate the interests of collectors. 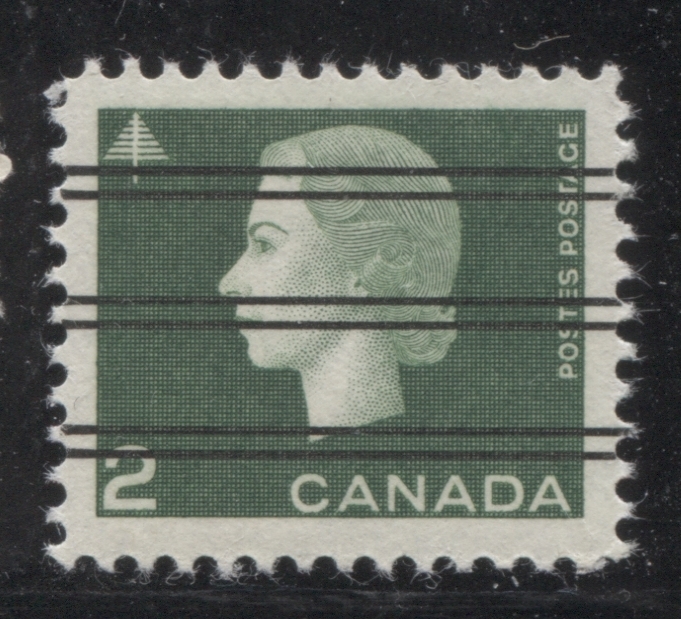 Thus in addition to differences in the cachets, there are also differences in the combination of stamps found on the covers. Finally, there were several different first day cancellations used, which I will call attention to as I go through the different cachet that I want to illustrate. I do not know if each potential stamp and cancel combination exists with each type of cachet. This would be the basis for a potentially very fun and rewarding collecting project aimed at seeing exactly what does exist. This type, showing the queen seems to exist only in black and white, but it is possible that coloured versions could exist as well. This third generic type seems to exist only in black and while as well. Here is the fourth type, which also only seems to exist in black and white as well. You will notice that all four of these covers have the same cancellation. It is an Ottawa duplex bilingual slogan cancellation which simply reads "Date of Issue" in English and French. The crown and E2R then appears in the lower left corner of the cancel. This is one of the types of cancellation that is often seen on these covers. So far in examining the First Day Covers of this issue, I have come across six different types of Rosecraft cachet, although I do recognize that there may be more out there. This first type is thermographed and there appears to be five different colours, corresponding to the colours of the low values, as well as a black type. 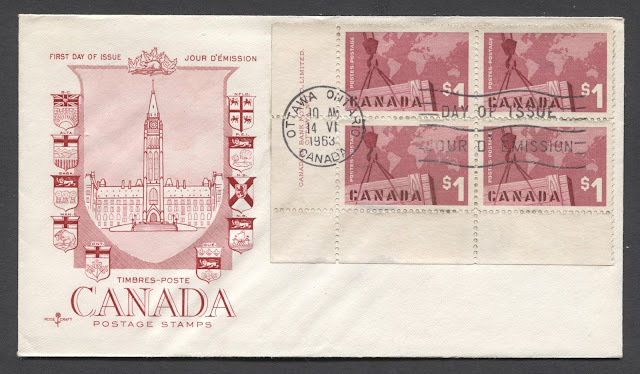 Generally, the colour of the cachet matches the colour of the stamps on the cover as in the above example. 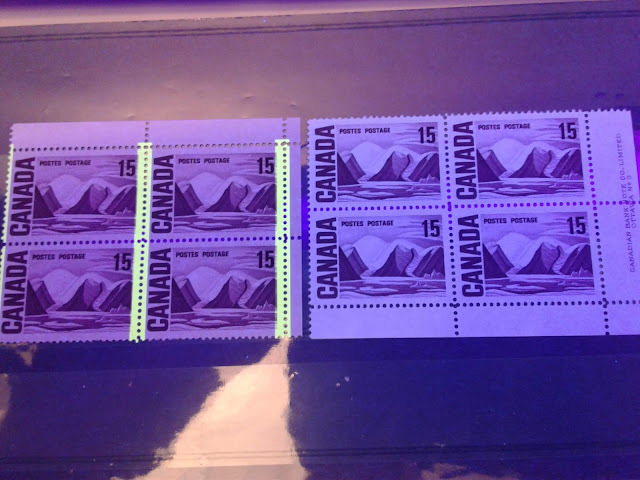 However, I have noted several instances where the wrong colour cachet is found with a particular stamp. I do not know whether every possible combination exists, but if they do, then this would mean a minimum of 6 x 5 = 30 different covers for a particular stamp combination. 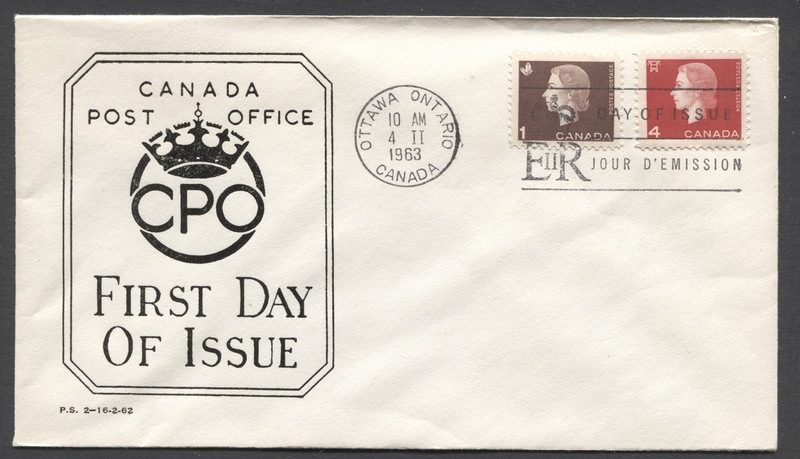 This cover illustrates nicely the second type of first day cancellation: they wavy line "Day of Issue" bilingual cancellation. This type of cachet was engraved and is value specific. 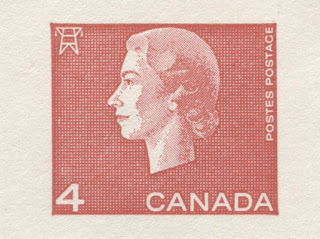 Like the first type above, it appears to exist in 6 colours as well corresponding to the stamp colours and then black as well. 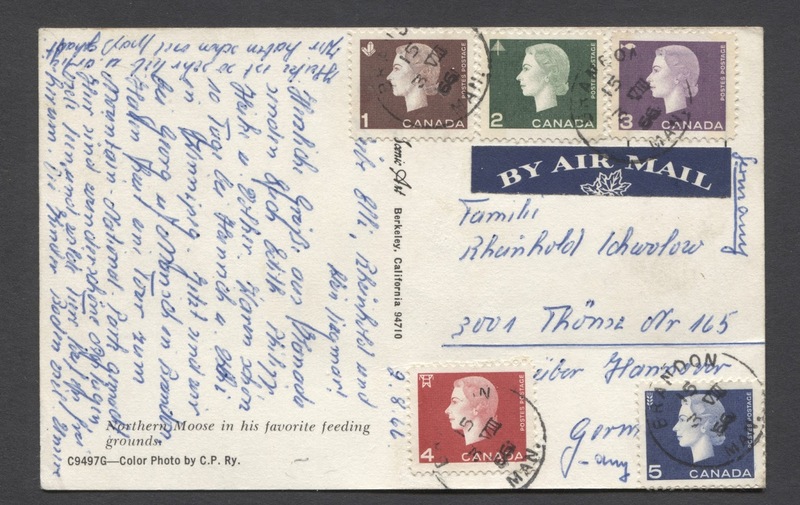 Like the first type, it appears that the wrong cachet can be found with a particular stamp, so that there could also be as many as 30 different covers for a particular stamp combination. This design in black appears to have been used for the Jet Plane stamp, although given that the 8c Cachet exists in blue, I have to think that this 7c cachet also exists in blue as well. I would appreciate clarification as to whether this is the case. 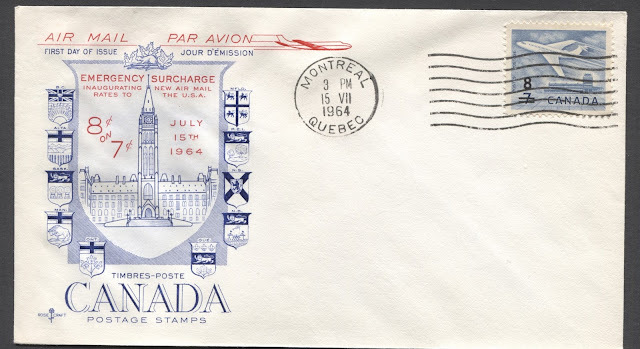 For the 8c on 7c surcharge, it appears that a standard type 1 cachet in blue was modified by adding "Air Mail Par Avion" at the top in red, the words "Emergency Surcharge. Inaugurating new air mail rates to the U.SA. 8c on 7c. July 15, 1964." inside design, above and to the side of the parliament buildings. However, there may be other types as well, like the above first type with a line through 7c and corrected to show 8c. This envelope shows no special first day cancel. Instead it is just a Montreal wavy line machine cancel that just happens to correspond to the date of issue. For the 8c stamp, here is a design that is almost exactly the same as the one used for the 7c. The existence of this design in blue calls into question whether both the 7c and 8c exist with both blue and black cachets. 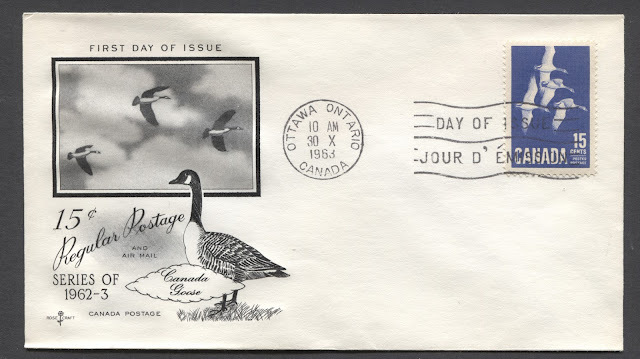 Finally, here is the design that was used for the 15c Canada Geese. Again, I do not know whether or not this cachet exists in blue. I have to assume from the above that there likely was a special cachet designed for the $1 Exports, although I have not seen it. Here is a thermographed black Canada Post Office Cachet. 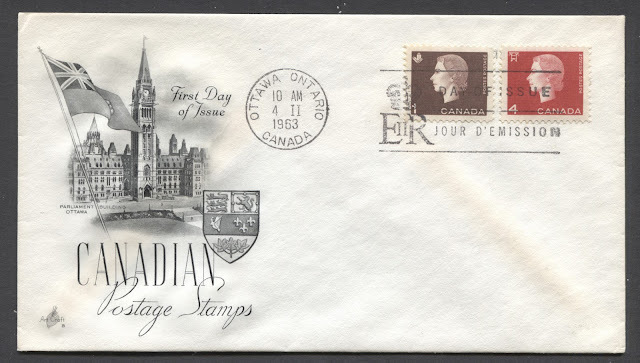 The date at the bottom suggests that this is an official cachet, of what the post office was before it became Canada Post. 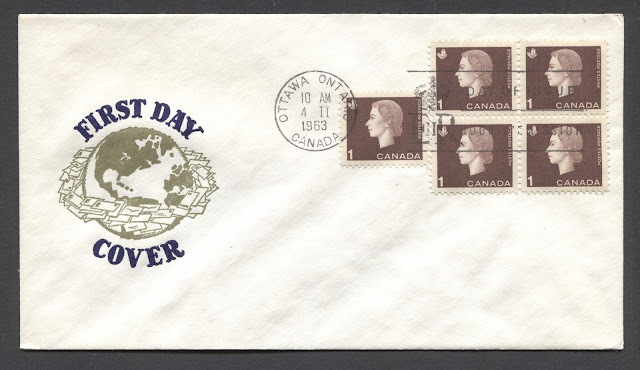 Thus the assertion that Canada Post did not issue first day covers prior to 1971 is not actually correct. I do not know who this cachet is by, as there is no identifying marking. However, I have seen it used on both this issue and on several commemoratives as well, so it would appear to be a very generic cachet design. Pure frankings in which all of the postage was paid using only stamps of this issue. 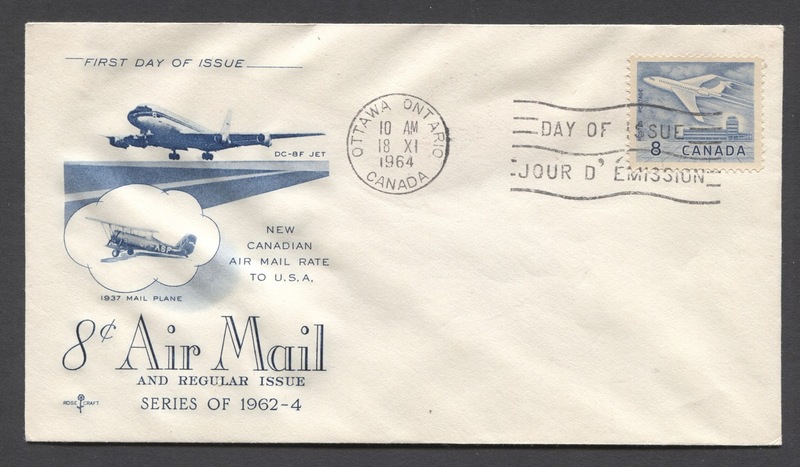 The earliest possible cover like that would be a single forwarded cover from October 3, 1962 with a copy of the 5c blue. But most covers like this will be from late 1963 or later. Mixed frankings involving this issue and commemoratives of the period. Again, these covers will generally date from after mid 1963. Mixed frankings using this issue and the previous Wilding Issue. These will be most common between October 3, 1962 and March 11, 1964 when the replacement of the Wilding issue was underway, but not fully completed. 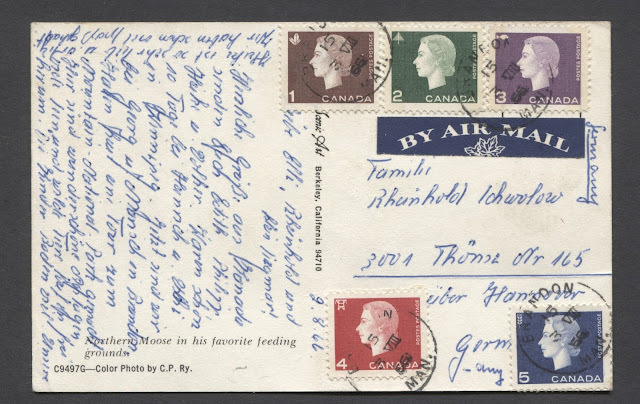 Here we have a postcard from 1966 to Germany where the airmail rate of 15c was paid using one of each of the low values from the 1c to 5c - a much scarcer thing than you would think. This is double weight registered airmail cover from 1964 to Germany. Here the 50c rate was paid using pairs of three different commemorative issues from 1964, plus two values from this issue. This is a really nice cover because of the number of different issues that were used, and the fact that they are all used in the proper period. 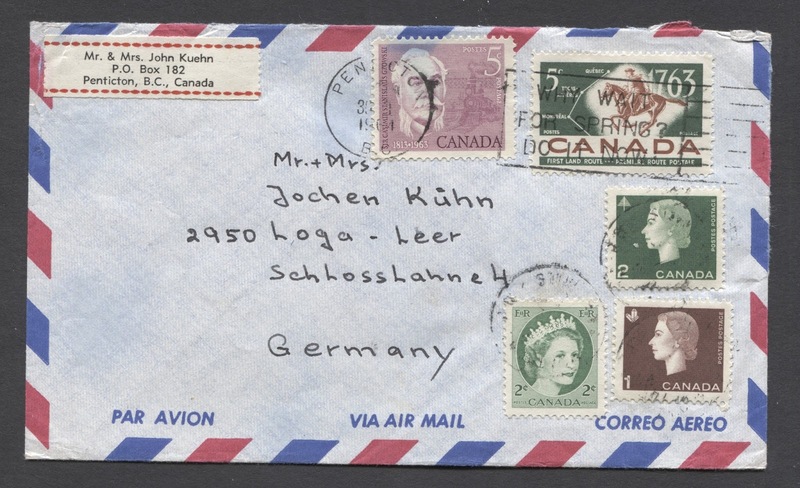 Finally we have a cover to Germany where the 15c rate was paid using no fewer than five stamps, including two commemoratives and both this issue and the previous Wilding Issue. This cover was postmarked in 1964, which is a wee bit late, as the 2c Cameo was already widely available for use. This would be a much more desirable cover if it was dated before May 2, 1963 and had two 2c Wildings instead of the 2c Cameo and the postrider stamp had been replaced by an earlier commemorative, like say the 1962 Trans-Canada Highway commemorative. But still, it is quite nice in the sense that you do not see multiple frankings like this all that often. So from a collecting standpoint, you can focus on either one or more of the above categories, or you can collect according to rates, and/or destinations. The possibilities are vast with this material being generally highly undervalued for its scarcity - at least for the better frankings. In terms of types of precancel there are only two types. The first are the three sets of thin horizontal bars as shown above. These are found on all five low values. The second type three pairs of thicker vertical bars which are found only on the 2c and 3c coil stamps. The above scan shows a block of 50 from the right hand pane, and shows the warning strip of 20 on the right side. Because of their size and the fragile nature of the paper in this gummed state, these strips are getting harder and harder to find. 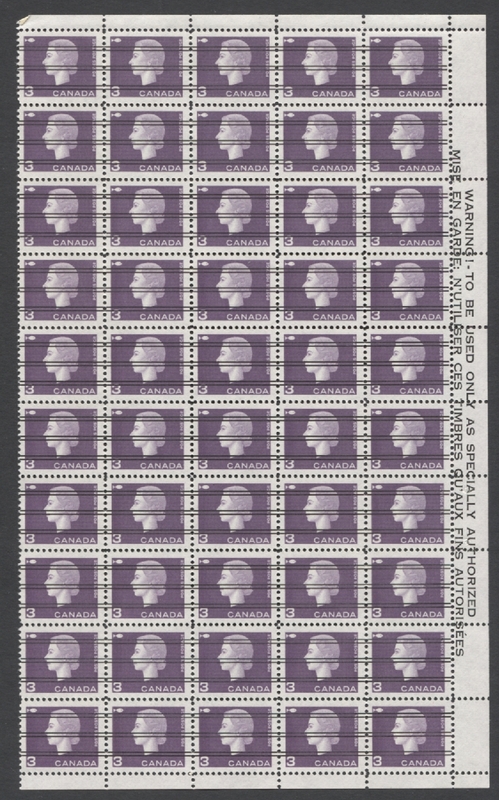 They currently list for between $40 and $56 in Unitrade - a minimum premium of 300% over the value of the single stamps. This concludes my exploration of this often overlooked Elizabethan definitive issue. I had some requests by readers to do a series of posts dealing with philatelic terminology, which I think is an excellent idea. So for the next couple of weeks, I will write an illustrated glossary of sorts, consisting of several posts dealing with philatelic terminology from A-Z. Then after these are done I will look at the commemorative issues from 1963 to the end of 1966. Are you aware of any tagging on the Cameo officials? No, I've never heard of any tagged officials. I suppose it is possible that a few may exist. But I would want to check the authenticity of the G overprint first before making any conclusions, as many of these have been forged in recent years.